"What you don't know, can do more than hurt you." To the Predacons, Night Stalker is more a legend than anything else. This is because none of them has ever actually seen him. They cannot deny that he could exist however, because since he came online the Maximals intelligence net has improved greatly. Night Stalker himself could care less what others think about him however, as he prefers to spend his time on espionage missions. 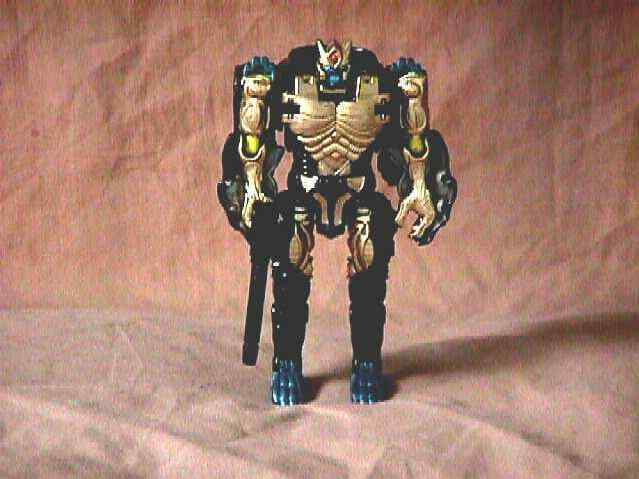 His stealth armor can absorb any sensor emissions sent against him and his signature masking device lets him fool Predacon security devices into believing him to be one of them. He wields a disrupter cannon that can scramble any electronic device it's beam hits. Although he can sprout jets and fly in a mode similar to Cheetor's, he prefers not to use it as it's infrared signature can be seen from miles away. Although it can hide him from detection, his stealth armor isn't very powerful protection in battle, especially considering the relatively passive nature of his beam weapon.